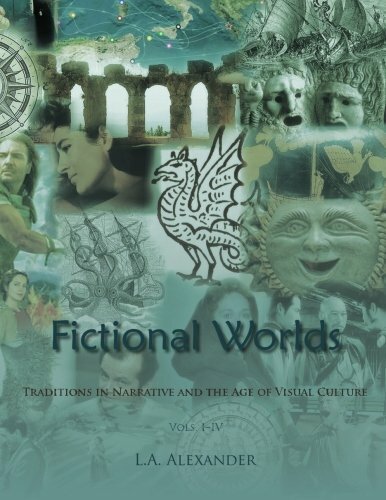 Click on the Book Cover image at the bottom of this page, or the Book Title, or the "Buy" button to visit Amazon.com, if you wish to purchase the book Fictional World: Traditions in Narrative and the Age of Visual Culture, and for more information available on the book's Amazon page. New! Digital versions of the print volume Fictional Worlds are available as a set of four ebooks on Kindle on amazon.com and coming soon four iBooks on the iTunes Store. A reader can choose between a print edition (4 volumes under one cover) or digital editions, which have added features. Fictional Worlds I: The Symbolic Journey & The Genre System is the FIRST part of the four-ebook Kindle set. It is linked to a print edition on amazon.com. Visit the author's page on amazon.com and see all available new books and formats in the Storytelling on Screen series, as they become available.